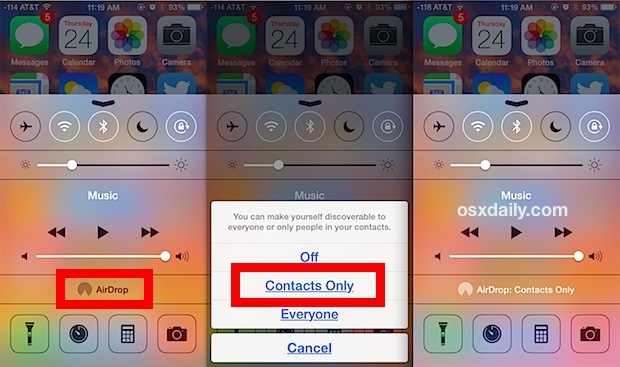 Those of us who regularly use AirDrop on the iPhone or iPad and leave the function frequently turned on for share requests may want to take a moment to adjust a simple privacy setting for the feature, allowing your iOS device to be only discoverable by Contacts. This prevents AirDrop requests coming in from random or unknown users, which if you’ve ever been in a busy office or place crowded with many iPhone and iPads, you may have encountered yourself. Changing the AirDrop discoverability setting takes just a moment and can be done from just about anywhere in iOS that Control Center is usable (note this means if you have Control Center disabled in apps or on the locked screen to prevent accidental use, you’ll need to be on the Home Screen). The AirDrop text within Control Center will change to indicate the new setting, and you can swipe out of Control Center now to keep the option preserved. This helps to to prevent unintentional AirDrop requests from nearby users, and can also add a layer of privacy to your own AirDrop use, since your iOS device will now only be visible to those that have been added to your Contacts list. Otherwise as you may know, when AirDrop is set to “Everyone”, your iPhone, iPad, or iPod touch will be visible to any other iOS user who is trying to use AirDrop to share something. It’s usually a good idea to turn AirDrop off when not in use, since leaving it on can cause unnecessary battery drain from device searches when the iOS sharing features are activated. This little privacy feature will probably become even more useful if and when iOS ever gains the ability to AirDrop files and data directly to and from Macs as well. I can’t believe that I can’t Airdrop to my Mac from IOS! It’s a bizarre oversight give the obvious utility of such a feature… but at the same time, that’s very Apple like. you forgot to mentioned for use AiDrop IOS & allow “contacts” only that required Icloud acompt enable…if not, no Airdrop !